Welcome to another installment of The World Through Sound. Last time, we talked about resonance and why some things ring while others don’t. In this article, we will go deeper into that concept and explore normal modes, the patterns of motion that are created when objects are driven at resonance. Resonance takes many forms, but one of the most common is known as “Standing Wave Resonance.” Essentially, a standing wave resonance is when a certain wavelength “fits” within some set of limits. In acoustics, we call these limits “boundary conditions,” and they are really just rules that tell us what traits a wave has to have to work in a given space. 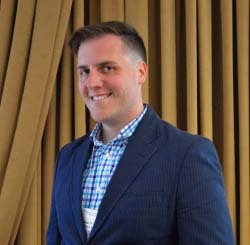 For example, if we were considering sound moving in a room, we know that air cannot pass through a solid wall, and so the boundary condition is that sound against the wall can’t cause the air to move. By applying this rule, we can eliminate all of the sounds that would cause the air at the wall to move, leaving us with only the sounds that are valid within that space. As long as the ends don’t move, a string can support many different wave shapes. For the string, normal modes have a very familiar shape: the sinusoid. And not just any sinusoid, but a sinusoid with a non-moving fixed point at each end of the string (that is, a sinusoid with a whole number of “bumps”). Sine waves like this neatly fit our boundary condition, that the end of the string can’t move, and so we know that they are valid. And while a sinusoid may not seem any more or less special than any other wave shape, because of a [mathematical principle discovered by Fourier, any shape that fits on the string can be shown to be little more than a combination of these fundamental sinusoids. And because of the relationship between frequency and wavelength, each of these modes corresponds to a unique resonant frequency. So when we pluck the string of a guitar (a shape rather close to a triangle), the sounds we hear come from the combination of all of those modes vibrating together. Some wave shapes are more fundamental than others. Every shape you can make on this string is really just made up of sine waves added together! Of course, taut strings are not the only things with normal modes, and (comparatively speaking) their modes are fairly simple. Far more interesting are the modes we find on higher dimensional objects, things like plates and membranes. In acoustics, a plate refers to any solid thin vibrating object (like a cymbal or plate glass window), and a membrane is made of a sheet of elastic material (like a drum head or a trampoline). And while you may not think that you listen to the sounds of vibrating plates and membranes as much as guitar strings, you might be surprised to learn than along with cymbals and drum heads, bells are essentially vibrating plates cast in the shape of a horn. With more dimensions comes more freedom of movement, and because a plate has two dimensions, there are far more shapes that can fit on it. 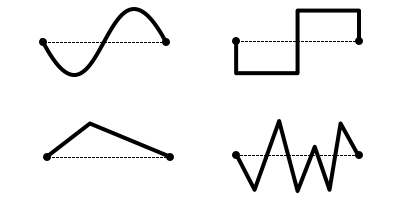 And much like the earlier example with the string, these shapes each correspond to specific frequencies, and lend the plate a unique sound based on its shape. But unlike the modes of a string, which are fairly boring sinusoids, the modes of a plate can form really beautiful and intricate patterns, as seen in this memorable YouTube video. Modal density tells how close different modes are to each other in frequency, and this also tells how distinct those modes seem. Modes that are far apart (50 Hz and 100 Hz for example) will be clearly different, while nearby modes (50 Hz and 51 Hz) will bleed together. Moreover, for two and three dimensional spaces, modes get closer and closer as the frequency gets higher. While this may seem counterintuitive, some high school level geometry should make it clear. Imagine that I had a right triangle where the two legs each have a whole number length (1, 2, 3, etc.). 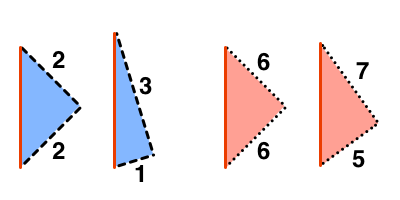 Now, let’s consider what the length of the connecting line, the hypotenuse, famously given by the Pythagorean theorem: a2+b2=c2. If a and b are both small numbers, then c will change a lot when either a or b is changed, but as both values increase the possible values of c become more closely spaced. While you could prove this to yourself mathematically, it’s far easier to show graphically. The Pythagorean theorem is useful for more than just passing high school geometry! Without going into too much math, this is a fairly apt comparison. The relationship between modal frequencies has this same sort of Pythagorean form, and so we find that higher modes eventually reach the point where they are indistinguishable. 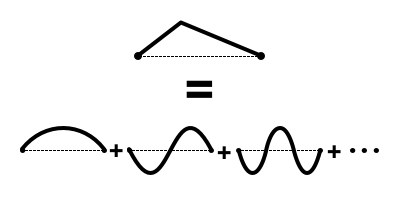 This point where modes stop acting like modes has a special name: the Schroeder frequency. Below the Schroeder frequency, individual modes can be identified, and above it, the modes are essentially continuous. What’s interesting about the Schroeder frequency is that it gets lower as rooms get bigger. For a room in your house, the Schroeder frequency might be around 200 Hz, meaning that sounds a person could hear between 20 and 200 Hz will be impacted by modes (this is why subwoofer placement is so important for home theater systems). A large concert hall, on the other hand, might have a Schroeder frequency of 20 Hz, making room modes almost irrelevant for listening. What I find truly interesting about this is the way that things move from being distinct to continuous. We see this effect all around use, like how your computer screen is made up of a grid of tiny pixels, but they are hardly noticeable unless you get very close. Or how even smooth surfaces are made up of tiny atoms. Even at the smallest levels, elementary particles are quantized into specific states, giving rise to quantum mechanics. This is just another way that sound can be used to learn about more than just sound. Next time on The World Through Sound, we will look at the concepts of refraction and reflection, and learn about how the weather can make sound move in unusual ways!